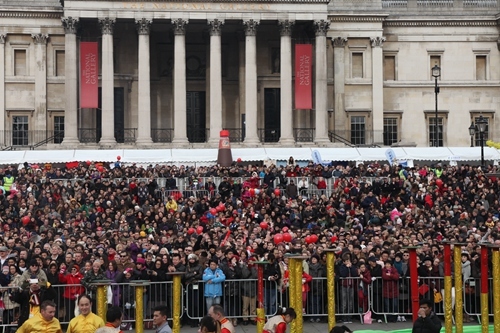 I am truly delighted to once again join you here at Trafalgar Square to celebrate the Chinese New Year. The Chinese New Year is also known as the Spring Festival. We celebrate the Spring Festival because it is the time to bid farewell to the harsh winter and to welcome the warm spring. The parks here in London as well as your gardens back home will soon be in full bloom and brimming with life. We celebrate the Spring Festival because it is a happy and joyous occasion. We give each other our best wishes, and we hope for happiness and good luck in the coming year. We celebrate the Spring Festival because it is a synonym of family reunion and bonds with loved ones. It is a symbol of the traditional family value of the Chinese people. For every Chinese on the road, Spring Festival is the time to be home. According to the Chinese calendar, this year is the Year of the Sheep. In the Chinese culture, sheep symbolizes safety, health, harmony and satisfaction. So, in this Year of the Sheep, I wish for peace and tranquility in the world. I wish for happiness and safety for people of every country. I wish for continued progress of China-UK relations. And I wish for health, harmony and satisfaction for each and every one present today. I want to extend my sincere thanks to the Greater London Authority, the Westminster City Council, the London Chinatown Chinese Association and all the volunteers who have worked hard to make today's event possible. I also want to express my heartfelt appreciation to all the artists for the wonderful performances we are going to watch. They are local Chinese artists and artists of the Chinese Culture Ensemble and Happy Spring Festival Ensemble who have traveled all the way from China. 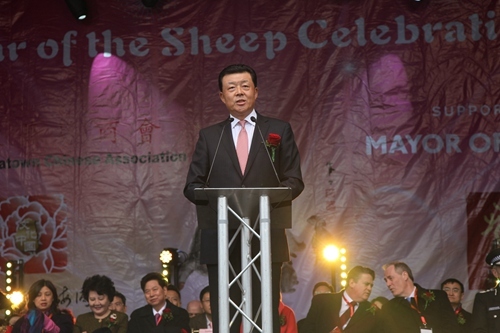 It is them who are giving us a happy, joyous and auspicious Spring Festival in London. Let's give them a big hand.